We told you back in May that the Truc Lam Buddhist Temple at Wilson and Ashland had gone on the market. It didn't take long for the lot at 1521 W. Wilson to be purchased, likely contingent on the granting of a zoning change from RS-3 to RT-4. This would allow construction of a 12 unit courtyard-style condo building. 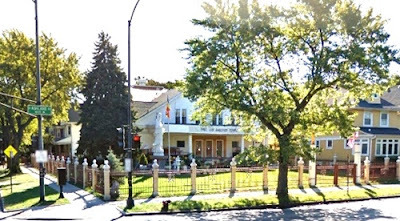 The Truc Lam Temple was originally built as a residence around 135 years ago when it was part of Lake View Township and not a part of Chicago. The proposal by Mavrek Development and Sullivan Goulette & Wilson Architects will be reviewed by Ald. Pawar's Zoning Advisory Committee, date to be announced. Full proposal details can be downloaded here. Very doubtful neighbors will approve of this. That block looks fairly low density, plus current building is quite handsome and historic. It would be very unfortunate if the required zoning change was approved and an ugly nondescript condo building went up there. Every corner of that intersection has a multi-unit building and it's half a block from the old American Indian Center which will be of similar density and was not fought at all. I like the fact that it's to be a courtyard building. Architects seemed to have given up on the very valid courtyard concept. I drive by the temple every day to and from work and have always admired its beauty. Change happens eventually, but it saddens me to think it will be replaced with more condos. Sorry Dear, Dear neighbors, please forgive me if you all have attended this lovely institution in the past, but lets face it, a nice big dwelling would bring more tax funds and more nice neighbors who can afford to support Uptown and all it's businesses and commerce--don't worry the building I'm sure will be gorgeous!